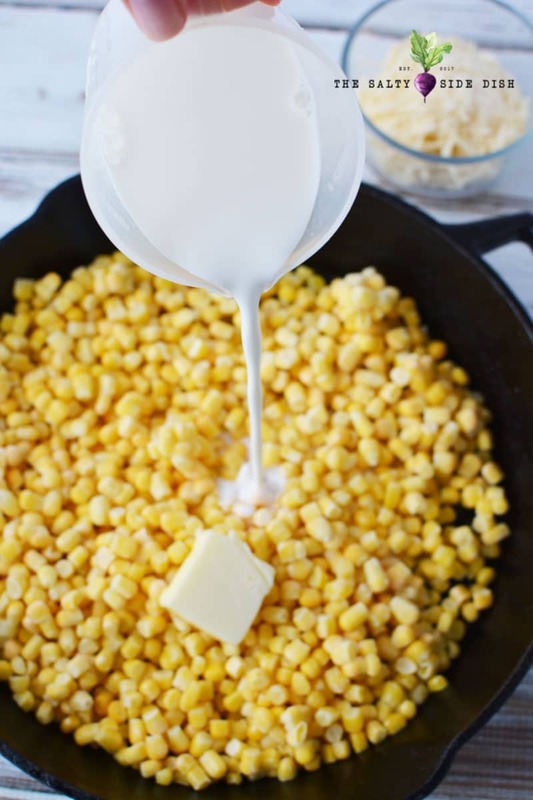 Homemade Cream Corn is a perfect corn side dish that adds a colorful and rich flavor to any of your main dish meals. Indulgent and delicious, you cannot go wrong with this mouthwatering and tasty corn dish as your next favorite way to enjoy this buttery veggie. Corn is one of the very few vegetables that I can get my kids to actually eat. Maybe its corns sweet nature or beautiful yellow color, but corn is just so friendly as a side dish on a plate! Perfectly balanced for main dishes like Alice Springs Chicken (copycat) or Honey Garlic Chicken, you can serve corn a variety of amazing ways. Mexican corn salad, corn pudding or traditionally like this corn casserole recipe, there is rarely a corn recipe that we won’t all gobble down- holiday or not. 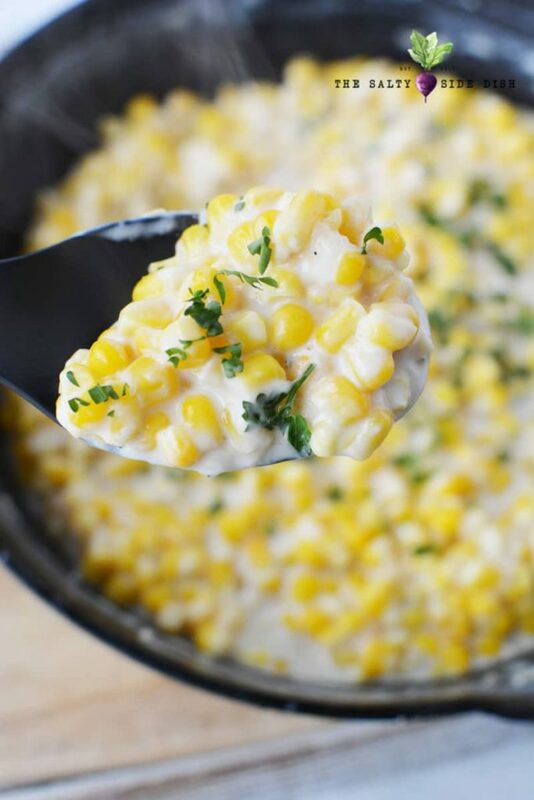 This particular homemade cream corn recipe coats beautiful pieces of crunchy corn (I love frozen for this reason) with a light flavorful Parmesan cheese sauce. Its not the same as “creamy” corn, which I consider a blended down corn kernel vs these whole corn pieces. You could easily alter this recipe to be that by mashing down some of your corn with the bottom of a cup after cooking or throwing half the corn into a blender prior to putting in the skillet. I use this trick often in other recipes when I want a more “mashed” end result. Embrace this dish for what it is- rich! If you are looking for a lighter flavor there are some substitution ideas below but I personally love how every bite is delectable. I hope you will love my favorite way to make a whole kernel cream corn side dish. Cast iron is my favorite. If you do not have one, get one! This cast iron skillet is my fav. 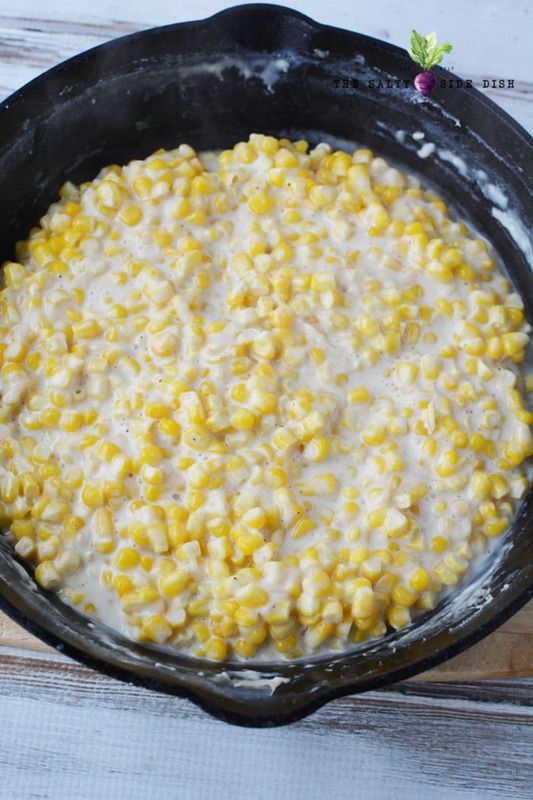 No crock pot or cans needed to make this perfectly delicious homemade cream corn. Personally I hate the overly soupy corn that falls out of a can on Thanksgiving (or really any) night of the week. 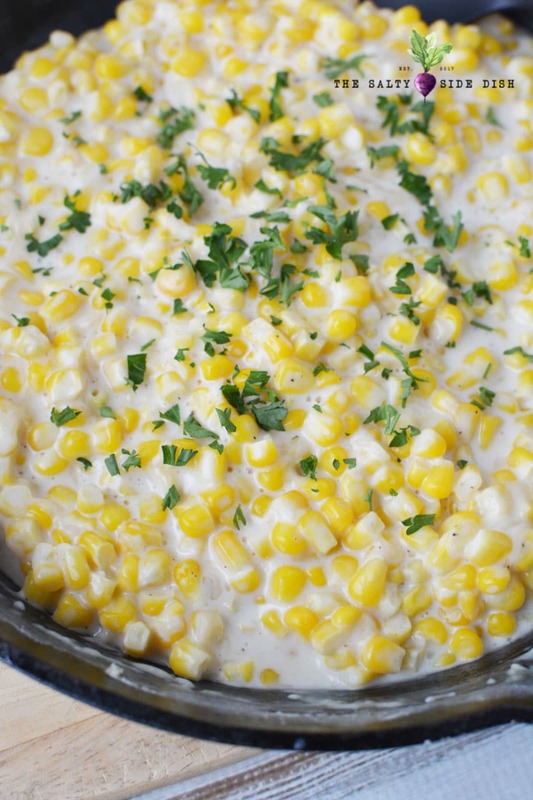 Learn how to make your own creamy corn recipe to serve up a delicious side dish tonight! 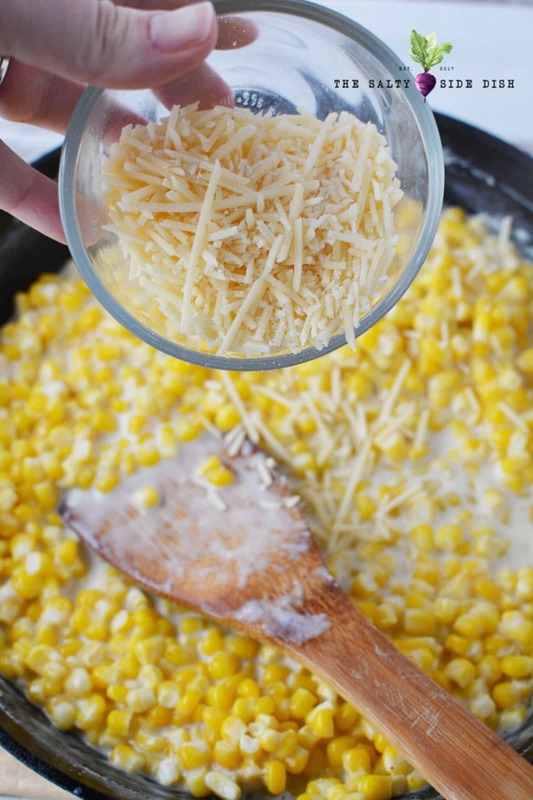 Add corn, half and half, salt, sugar, butter and pepper to a large skillet. Mix together milk and flour in a small bowl and add to homemade cream corn mixture. On medium heat, cook until bubbling, stirring frequently. 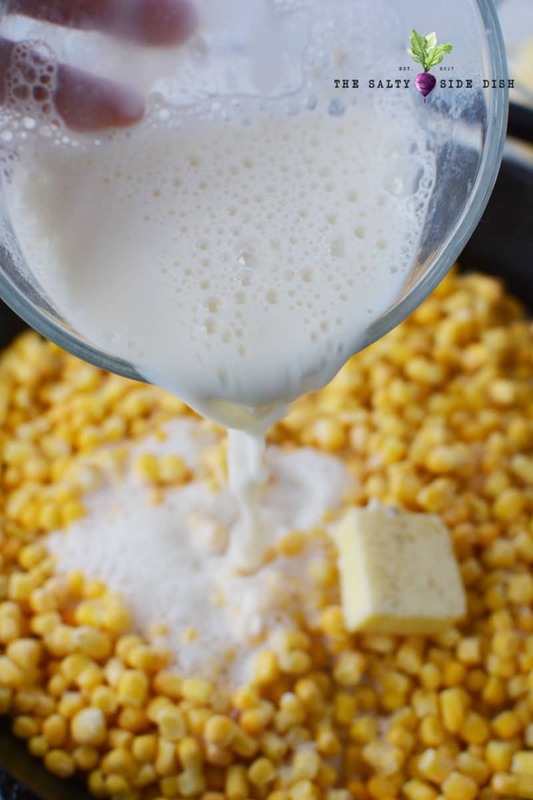 Reduce heat to medium low and continue to heat/boil and stir frequently until cream style corn mixture is thickened. Add Parmesan cheese and stir. Parmesan will melt into the mixture. Serve with fresh parsley or one of the other topping suggestions below. Can you use Heavy Cream instead of Half and Half? You can! Half and Half is equal parts milk and heavy cream while heavy cream itself is just that. If you prefer a richer flavor, you can use only heavy cream instead. Can you use Canned Corn instead of Frozen Corn? Personally I prefer frozen corn, but you can use canned corn (just drain it) in this recipe. You can also use fresh corn on the cob corn as well, just make sure your corn is tender and cooked all the way through so you do not break a tooth on your bite! Remember different kinds of corns will change how long you cook and this creamed corn recipe is based on a cooked corn. What kind of Toppings for Creamed Corn? Want to dial up your corn side dish? Serve with bacon, bread crumb topping, chives, fresh additional Parmesan cheese, shredded cheese, diced jalapenos, or a little bit of crackle pepper. If you need a little color, you can top with parsley like I did or even a dash of Paprika, which puts a pretty read sprinkling like a deviled egg. I personally believe recipes should be made your own and to your own tastes. 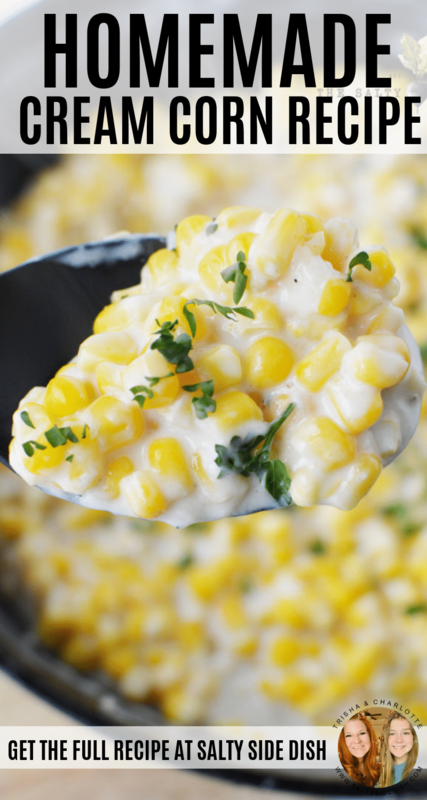 Here are a few suggestions to get your mind flowing on altering this creamy corn recipe. Want it Richer? Want your corn even richer? Substitute your 1/2 cup of milk and flour for half a bar of cream cheese. Instead of Parmesan, try other types of cheeses that you love like Asiago or Romano. Look below to print this cream corn recipe and bring with you to the kitchen. Seems old fashioned but I find it easier than having an open phone on mobile on when I am cooking. I always print recipes. Mix together milk and flour in a small bowl and add to corn mixture. Reduce heat to medium low and continue to heat/boil and stir frequently until mixture is thickened. Remove from heat and add Parmesan cheese and mix until melted. Serve topped with fresh parsley or one of the other suggestions below. Add corn, half and half, salt, sugar, butter and pepper to a large skillet. Mix together milk and flour in a small bowl and add to corn mixture. On medium heat, cook until bubbling, stirring frequently. Reduce heat to medium low and continue to heat/boil and stir frequently until mixture is thickened. Serve topped with fresh parsley or one of the other suggestions below.